Large pores on our face make our skin to look old and unhealthy. In people with oily skin large pores can give rise to other skin problems, like acne and blackheads. Today we are going to share some home remedies to treat these large pores on your face, nose, cheeks. Many of the store bought chemical rich products for large pores worsen the problem. To get rid of these large pores, first you need to know why do these large pores appear? (i) Overexposure to the Sun: The harmful UV rays damages the skin collagen, thereby reduces the elasticity of the walls of the skin pore canals leading to enlarged pores. (ii) Ageing: Age is another factor that causes enlargement of the pores, as we age the skin loses its elasticity and the open pores tend to enlarge. (iii) Hereditary: For some of us it’s in our genes that causes enlarged pores. (iv) Oily skin: If you have normal skin the natural oil (sebum) clearly flows through the skin pore lining to get out of the pore and spreads over the skin’s surface slowly. But if you have oily skin then your oil glands produces a lot of excess oil which combines with dead skin cells, dirt, sweat and then clog the pores. Which in turn causing the pores to get enlarged so that the oil can flow. How To Get Rid Of Large Pores On Nose, Face And Cheeks? Now that we know what causes the pores on our face, nose and cheeks to enlarge, lets look at how we can treat these large pores and get rid of them. There are many option cosmetic products available in the market to treat enlarged skin pores, but you need to know that these products are loaded with chemicals which can cause other skin problems, So why take the risk when there are so many natural home remedies to get rid of large skin pores on your face, nose and cheeks. These natural remedies work amazingly to reduce the size of the open pores and reduce the appearance of blackheads. Read on to know how to treat enlarged pores naturally. When oil gets clogged in the open pores, they tend to look enlarged. One quick way to treat these large pores on your face, nose or cheeks is by exfoliating your skin to remove all the excess oil and impurities from the skin. To reduce the size of your existing enlarged pores, you need to Exfoliating your skin helps to remove the dead skin cells that thicken the excess oil and cause large pores. You can make your own homemade natural scrub by mixing some grounded dry orange peel and grounded almonds. 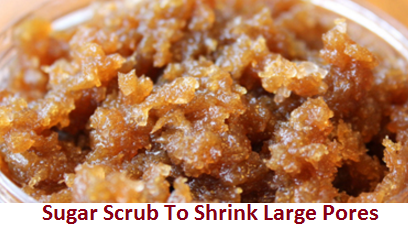 This homemade scrub works excellently to remove dead skin cells and cleanses the skin. Once your skin is cleansed the size of the big, opened pores on nose, cheeks and face automatically reduces. This is an excellent way to reduce large pores on your face, nose or cheeks. Lemon juice is known to firm up and tighten the facial skin as it contains natural enzymes which do so. The acidic properties of lemon juice cleanses your skin from within, and the vitamin C content of it helps in lightening the skin. For getting rid of large skin pores naturally, just mix 1 tablespoon of lemon juice with 1 cup of rose water and 1/2 cup of cucumber juice. Mix everything up thoroughly and apply this mixture on your skin affected by enlarged pores. This treatment is used to cleanse, lighten the skin and for shrinking pores as well. Apple cider vinegar is a natural astringent and skin toner which works to remove excess oil, blackheads or whiteheads and cleanses your skin pores from within. This helps to get you naturally tighten skin, with smaller pores, and skin’s with a proper pH balance. The antimicrobial and anti-inflammatory properties of apple cider vinegar help in treating acne and pimple problems. 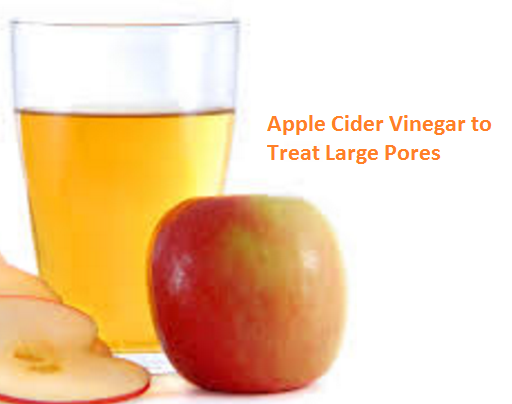 To treat large pores just mix some organic apple cider with equal parts of water. Now soak a cotton ball in this mixture and apply it gently onto the big pores on your face, nose, chin and cheeks and leave it there for a few minutes, and wash it off using cool water. Do this every night after cleansing your face and Follow up with a gentle moisturizer. Egg white face mask is a great natural remedy for drawing excess oil out of your skin. This face mask also helps in shrinking large pores, by toning and tightening the skin. You can make an Egg White Face Pack by whipping one egg white and apply it evenly over your face. Let the egg white dry out completely on your face, and then wash it off. When the eggs white dry out it’s known to pull debris out of pores and tightens the skin. Try this once or twice a week to see the difference in a few weeks. Alternatively, you can make a mask by taking 2 egg whites and whisk it and mix a juice of 1/2 a lemon. Apply this mask evenly on your face and let it dry out completely. Rinse your face with water. Repeat this few times a week for best results. You can also use Egg Whites to make a face scrub for which you need to take 1 egg and whisk it and mix in 2 tablespoon each of lemon juice and oatmeal. Apply this scrub onto your face, and let it dry out and remain on your face for about 30 minutes. Scrub your face gently and rinse your face with cool water. For fast results, do this remedy twice a week. This Tomato lotion remedy works amazingly to reduce enlarged skin pores. Tomatoes are said to have astringent properties which help to remove surplus oil, tighten the skin, and minimize large open skin pores. Tomatoes also slow down aging of the skin and help to repair skin fast as they contain lycopene and anti-oxidants. To make a tomato lotion just mix 1 tablespoon of fresh tomato juice with 3-4 drops of freshly squeezed lemon juice. Apply this lotion on your face to treat enlarged pores. Let the lotion sit on your skin for about 15 minutes, and then wash it off with cool water. This remedy can also be used to remove blemishes from your face. Baking soda is known to be a gentle exfoliating agent, which helps in getting rid of excess oil, dirt and impurities from your skin. 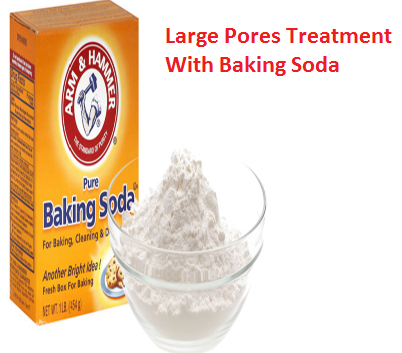 Baking soda works to make your skin clear, fare and reduces the skin pores. It also restores the pH balance of the skin. The antibacterial and anti-inflammatory properties of baking soda help treat skin problems such as acne and pimples. To use this home remedy you need to combine 2 tablespoons each of baking soda and lukewarm water. Spread this mixture on your skin and massage it gently in circular motions for few seconds. Wash it off using cool water and apply a moisturizer to moisturize your skin. Use this remedy every day for 6-7 days to start seeing improvement in your skin. Clay masks help to absorb the excess oils from the skin and are great home remedy for treating large pores. Fuller’s earth (popularly known as multani mitti) is an effective home remedy to treat large open pores. It also works to reduce scars and blemishes and treat sun-damaged skin as well. For this home remedy just combine rose water with 2 tablespoons of fuller’s earth, and blend these two in the blender to make a smooth paste. Apply this paste on your face and let it sit there for about 25 minutes until it dries. Now scrub your face gently to remove the mask and finally rinse your face with cool water. Follow this treatment with a gentle moisturizer. For best results repeat this home remedy once or twice a week consistently. For ages homemade sugar scrubs have been used for exfoliating the skin, removing extra oil and debris from your skin pores. It also has the ability to reduce large skin pores. For this home remedy just put a little bit of sugar on a lemon wedge and gently rub it on your entire face. Let it be there for 10 minutes and then wash your face with cool water. Try this remedy twice a week. You can also combine 2 tablespoons of sugar, 1 tablespoon of olive oil and a few drops of freshly squeezed lemon juice and mix them well. Massage your skin gently using this mixture for about a minute and then wash it off using cool water. Use this remedy up to twice a week consistently. Alternatively you can make a sugar scrub by mixing honey, freshly squeezed lemon juice and a little sugar. Apply this homemade scrub on your skin and gently rub it, now let it sit there for about 10 minutes, and then wash it off. Apply this remedy twice a week to see the results. 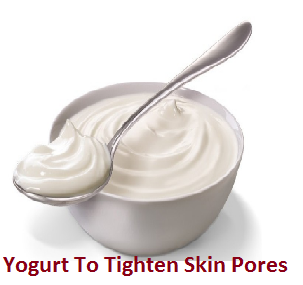 Yogurt is one of the best natural remedy for shrinking large skin pores and removing blemishes from the skin. The lactic acid present in yogurt helps to minimize pores size, tighten skin, remove dead skin cells, and get rid of excess oil and impurities from the pore openings. For this all you need to do is take some fresh unflavoured yogurt and apply it directly on your skin before, let it sit on your skin for 10 minutes. Now rinse it off. Now we know how to get rid of these ugly large pores from our face, nose and cheeks let’s look at some natural beauty tips to prevent this problem in the first place. (i) Avoid using skin-care products that cause blocking / clogging of pores or make your oil glands produce more oil. Do not use skin products which are too thick or greasy. Cause such products will result into clogged pores. (ii) Avoid using products that dry or irritate your skin, as they cause your oil glands to produce more oil in the pores. (iii) Avoid using bar soaps as they contain chemicals which can clog pores. (iv) Use only water soluble cleansers which are gentle on the skin. (v) To moisturize your face always use a water based, oil free moisturizer. Moisturizing your face is very important to treat enlarged pores and have healthy, glowing skin. As skin which is De-hydrated can make your oil glands yield more oil, which causes clogging of pores, acne breakouts and blackheads occurrence. (vi) Choose your makeup wisely and make sure to remove your makeup at night. Not removing your makeup every night can further block your already clogged pores, thereby increasing the chances of blackheads and white bumps, and make your skin look dull. Avoid using thick, heavy makeup to hide marks, even out an uneven skin tone, or conceal large pores as such cosmetics are loaded with chemicals which can aggravate your skin problems. These are some of the best natural home remedies for treating enlarged pores. 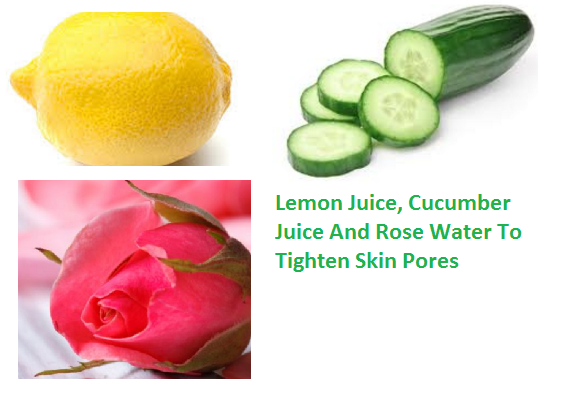 These natural ingredients will surely work to unclog the skin pores and make your skin glowing and blemish free.